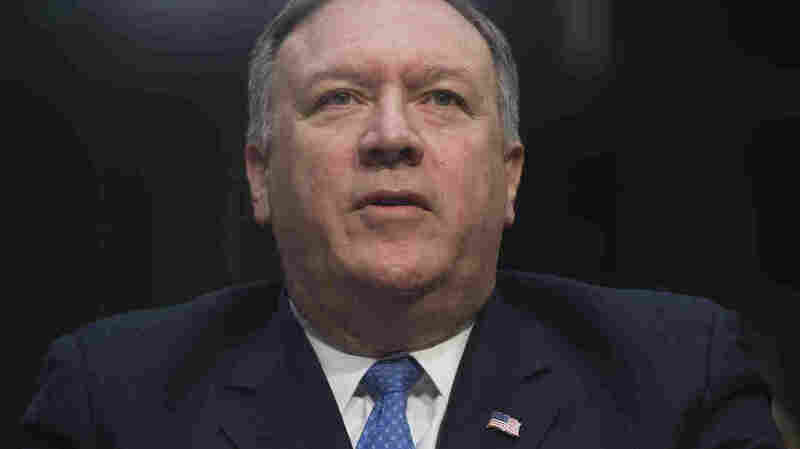 Bolton and Pompeo Comments On Islam Alarm American Muslims Even as President Trump is warming relationships with Muslim nations in the Middle East, he is antagonizing U.S. Muslims with his choice of a new national security adviser and secretary of state. CIA Director Mike Pompeo testifies on worldwide threats during a Senate Intelligence Committee hearing on Capitol Hill on Feb. 13, 2018. Pompeo, President Trump's pick to lead the State Department, has portrayed the fight against terrorism as an epic holy war. John Bolton, heading to the White House on April 9, has long denounced "radical Islam" and suggested that the shadowy movement known as the Muslim Brotherhood be designated a foreign terrorist organization. He serves as chairman of the Gatestone Institute, a conservative think tank whose website regularly highlights negative stories about Muslim immigrants. CIA Director Mike Pompeo, Trump's pick to lead the State Department, has meanwhile portrayed the fight against terrorism as an epic holy war. "The threat to America is from people who deeply believe that Islam is the way and the light and the only answer," he told a church group in his hometown of Wichita in 2014. "They abhor Christians and will continue to press against us," he said, "until we make sure that we pray and stand and fight and make sure we know that Jesus Christ as our savior is truly the only solution for our world." Such statements have outraged some Muslim civil rights advocates. "By appointing these highly controversial individuals, the Trump administration is normalizing anti-Muslim sentiment," says Nihad Awad, executive director of the Council on American-Islamic Relations (CAIR). "Trump is sending a green light for average people to mistreat Muslims." An aide to Bolton told NPR he is not available for comment. A CIA spokesperson, asked about Pompeo's comments on Islam, directed NPR to a promise he made during his confirmation hearing that discrimination against Muslim employees at the CIA "will not be tolerated." In Wichita, however, Pompeo has a history of tense relations with local Muslim leaders. In March 2016, he criticized the Islamic Society of Wichita (ISW) for extending a speaking invitation to Monzer Taleb, a Texas-based imam whom Pompeo described as a "Hamas-connected sheik." In a public statement directed to the mosque leaders, Pompeo said that if the event were not cancelled, "They will be responsible for the damage among religious faiths that is sure to follow." Following that warning, anti-Muslim protesters planned a demonstration outside the mosque, and the Wichita police advised the mosque leaders that some of the people were likely to be armed. The organizers promptly cancelled the event, but the episode unnerved the ISW leadership. Hassam Madi, the ISW spokesman, said Pompeo's comments on Islam over the years "scare" the Wichita Muslim community. "What that does is, it ignites the others that are holding some hatred," Madi told NPR, "or even are willing to take their thoughts into action and ... hurt someone that might practice the Muslim faith." Since becoming the CIA director, Pompeo has largely avoided controversy. The CIA spokesperson noted that Pompeo "has worked extensively and successfully to strengthen and expand CIA's partnerships with countries throughout the Muslim world." Saudi Arabia and its Gulf allies are notable examples of those partnerships. Trump's first overseas visit began with a stop in Riyadh. His administration has supported the Saudi offensive in Yemen, and he has spoken warmly of Saudi and other Gulf leaders. Their countries were cool to President Obama, but with President Trump, the Saudi and Gulf governments share a deep distrust of Iran. "They're quite happy and look at the Trump administration with a sigh of relief," says Brian Katulis, a frequent Middle East visitor who served in the Clinton administration and is now a senior fellow at the Center for American Progress, a left-leaning think tank. "They were glad to see Obama go," Katulis says, "in part because he did not pick their side. He tried to keep America above the fray and not engage deeply in these political conflicts." The administration is also on increasingly good terms with Qatar, an independent Gulf state that is shunned by Saudi Arabia and the United Arab Emirates but which hosts a huge American air base at al-Udeid. On Thursday, the White House announced that President Trump will receive the Qatari emir, Tamim bin Hamad Al Thani next Tuesday, April 10. The Trump administration's deepened relationship with Muslim allies in the Middle East stands in sharp contrast to its cooler relations with U.S. Muslims, who report increasing harassment and are increasingly the target of hate crimes, according to FBI data. Muslim governments that focus first on their own security, however, do not seem overly concerned about the plight of their co-religionists in America. "To me, that is unfortunate and painful to see, says CAIR director Awad. Once a regular visitor to Saudi Arabia and other Gulf states, Awad says he rarely travels to the region anymore because of what he claims to see there: "Key influential leaders in so-called Muslim countries dealing with hateful, anti-Muslim bigots and organizations, just to save their thrones or protect their own interests." The Trump administration's narrowed focus on government-to-government alliances with Muslim states means less emphasis on winning Muslim hearts and minds, a goal that got more attention under Presidents George W. Bush and Barack Obama. Farah Pandith, who worked on global Muslim outreach during the Bush and Obama Administrations, concluded that part of what drives young Muslims to radicalism is an "Us versus Them" mindset and that the United States needs to undermine that mentality through a policy of engagement. "The commander in chief and his entire cabinet need to make sure everything they're doing hits that chord," Pandith says. Otherwise, she says, terrorist groups can take advantage. "They take our words and use [them] against us," Pandith says. "They create videos and sound bites, so they can say, 'Look, we told you that the West is against Islam. We told you that America hates Muslims. And look, we can prove it.'" Advocates for the approach a Trump/Pompeo/Bolton team is likely to follow point out that engagement policies in the aftermath of the Sept. 11 attacks have not been all that successful in combating Islamist terrorist groups and that strengthened partnerships with countries in the Muslim world hold more promise. "These relationships are critical to keeping America safe," says the CIA spokesperson, who asked not to be named. "By way of example, the Agency's work on countering terrorism around the world .. has been in concert with many Islamic countries and has ... saved countless Muslim lives and added security to the Muslim peoples of those nations."